Welcome to the SGNA virtual press kit. Below you will find additional information about SGNA and our practice documents; if you would like additional information or interested in an interview, please contact us! The Society of Gastroenterology Nurses and Associates, Inc. is a professional organization of nurses and associates dedicated to the safe and effective practice of gastroenterology and endoscopy nursing. SGNA carries out its mission by advancing the science and practice of gastroenterology and endoscopy nursing through education, research and collaboration, and by promoting the professional development of its members in an atmosphere of mutual support. For more than 35 years, SGNA has served as the voice of more than 8,000 members and their patients. View our mission statement and history. The development of practice documents includes two processes: the creation of new documents and the revision of current documents. The Practice Committee conducts a thorough review of research for both processes and meets to discuss the documents in great detail. A description of these processes can be found on the SGNA website in the form of a one-page outline as well as a webinar. 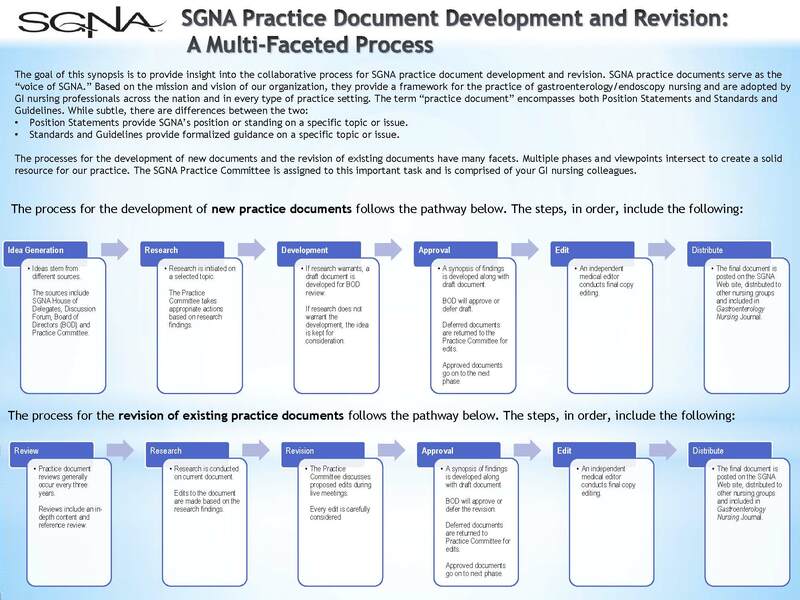 Who Uses SGNA Practice Documents? As Center Director for the Tulsa Endoscopy Center, Lisa Fonkalsrud brings her ASC perspective and strong leadership skills to SGNA. A clinical nurse manager at Indiana University Health Physicians, she is a leader in connecting the dots between practice, policies and procedures. As the HCV Nurse Coordinator for the VA Healthcare System in San Diego, Ann’s leadership and deep understanding of reprocessing are key. A manager of endoscopy unit at Sharp Memorial Hospital and OPP (OutPatient Pavilion) in San Diego, Midolie’s eye for detail and penchant to see the bigger picture are a driving force. Dr. Schmelzer is an authority on the need for evidence, having led numerous research studies and being one of the first published SGNA Scholars. A regular faculty member for SGNA educational programs, she is our resident expert on storage and hang-time.